Thrillers are defined by logic. But what happens if it happens over a day or few hours? Yes, we close our eyes and hope for the luck to play its part. Streetlight is not different. It’s an art of synchronicity. A series of non-relational events that force to cause bright ending. The movie which directed by debutant Shamdatt Sainudeen and written by debutant Fawaz Mohamed will give a joyful experience throughout. The movie starts with clash under Streetlights which was an after effects of a robbery. Megastar Mammootty who plays the role of a cop sets out to investigate the robbery. The movie which happens over a daytime then introduces lots of characters all having their own story but contributes well to the major plot. As said earlier the movie is a work of synchronicity and major pieces of stuff happen by chance to by choice. The major positives of the movie are the direction and script. Shamdut who worked as a director of photography never forgot to keep good frames for his directional debut. Fawaz Muhamed another debutant do come with good script also noticed give importance to every character even if had a Mega Star in the pocket. He also noticed to cut down the character glorification of a major star like him. Every actor did justice to their character, while Dharmajan, Hareesh, and Soubin did a wonderful. 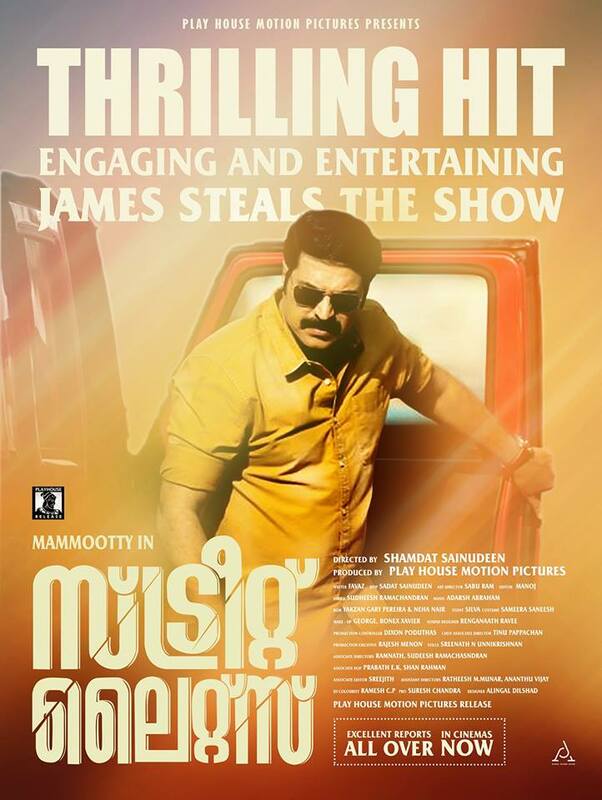 Mammootty did a wonderful job again and James will be one of his coolest characters. Background music was quite effective and it created a good mood for the plot. The audience might have felt negative about editing but the point is that it was trying to give a Mercury shade of streetlights to the visuals. All together Streetlight is a good thriller with some interesting characters and plot. And in fact the best of Mammootty after The Great Father. All together Streetlight is a good thriller with some interesting characters and plot.